The cornea is the outermost layer of the eye that covers the iris, pupil and anterior chamber, and is continuous with the white sclera. As part of the eye ball it has to be strong to protect the inner contents of the eye, as well as transparent to allow light into the eye. These properties are provided by its principal component, the protein collagen, which is laid down in the form of highly organised fibres, parallel to the surface of the tissue. However, the cornea is constantly pulsing back and forth as blood is pumped round the body. It is also readily apparent that if you press on the front of the cornea (by rubbing your eyes, for example) the cornea regains its original shape immediately the pressure is released. Fig. 1. 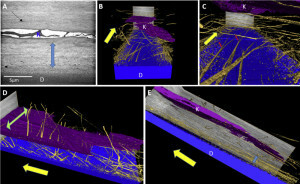 3D reconstruction of elastic fibres in the outer region of the cornea. Gold – elastic fibres, Blue – Descemet’s membrane (a basement membrane at the back of the cornea), Pink – Keratocytes (cells.) The blue arrows show a concentration of elastic fibres bellow the keratocyte. Red arrows in image C show the fibres splitting into different branches. Yellow arrows show the preferential direction of the fibres. In many other tissues of the body that are constantly pulsating (such as heart valves) or are elastic (such as skin), the restoring force is provided by the presence of different fibres, called elastic fibres, which restore the original shape when the tissue is deformed. It has been suspected for a long time that the human cornea contains elastic fibres, but their organisation within the tissue has remained a mystery. Therefore, our aim was to provide insight into the presence and three dimensional arrangement of elastic fibres in different parts of the human corneal stroma. 3D reconstructions of the corneal stroma were created using a technique called serial block face scanning electron microscopy. The cornea is cut into small pieces, and as the tissue is transparent, it has to be stained with various chemicals to be visualised under the microscope. Once stained and inside the microscope, the surface of the cornea sample is imaged before a very thin slice (less than 1000th the thickness of a sheet of writing paper) is cut away. The newly exposed surface is imaged and this process is repeated until a large stack of images has been obtained. These images can then be combined using imaging software to create a 3D reconstruction of the cornea. 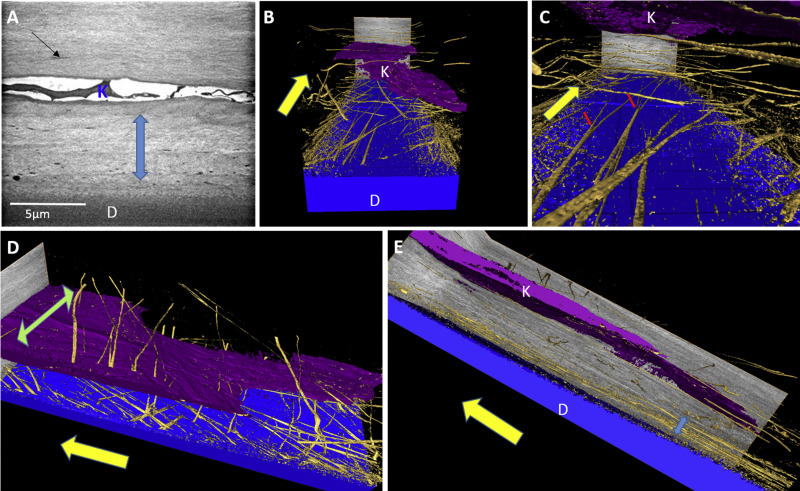 Our 3D reconstructions showed that long elastic fibres were highly concentrated in a thin layer of tissue at the back of the cornea (Fig. 1). These fibres were present in both the central and outer regions, and appeared to travel in various directions parallel to the surface of the cornea. Furthermore, the elastic tissue was present as broad sheets at the very edge of the cornea. By imaging the full thickness of the tissue, starting at the front surface and ending at the back, we were able to measure the quantity of elastic fibres throughout the entire depth of the corneal stroma (Fig. 2). 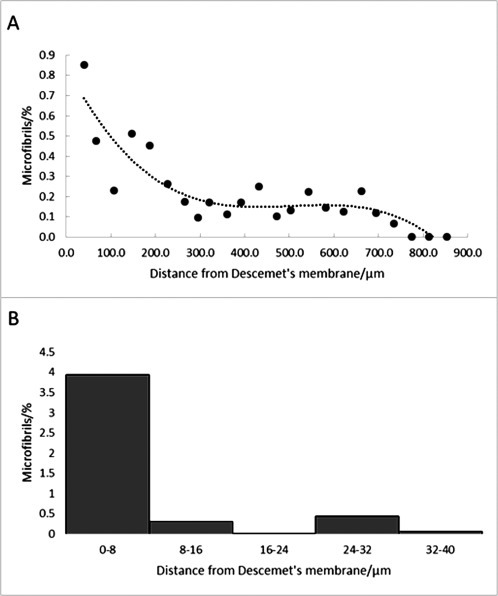 This data confirmed that fibres were significantly more concentrated at the back (as seen in Figure 1) before rapidly decreasing in number as you move towards the front surface of the cornea. Although the functional role of this elastic network is currently unclear, we contend that it plays an important part in the biomechanical properties of the cornea, assisting in regaining its shape following deformation. We have also discovered elastic fibres in embryonic cornea, suggesting that they play a role in early development. Additionally, the elastic fibre system has important clinical implications for corneal transplant surgery. Surgeons may either remove a corneal button of full thickness, where the elastic network would be lost, or they may remove a partial thickness button, where a thin layer of cornea at the back, and therefore the elastic network, is left intact. This is something that should be considered, as removing the elastic network could result in additional problems. Three-dimensional arrangement of elastic fibers in the human corneal stroma.